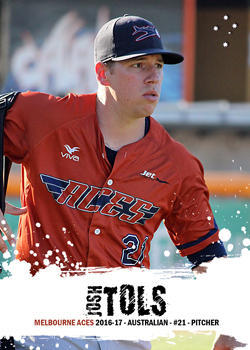 Adelaide born Tols moved from the Bite, where he'd played in three previous three years, over to the Melbourne Aces for the 2016-17 ABL season. 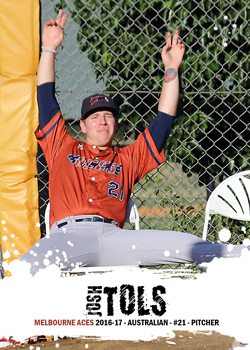 In 2016, between his ABL club movement Tols also played with the Kansas City T-Bones in the independent American Association. The old rule of never muck up when there's a camera around is always in effect. Tols and another pitcher were trying to manspread in the background of my shots of other Aces pitchers in the bullpen, so there has to be a card of that..